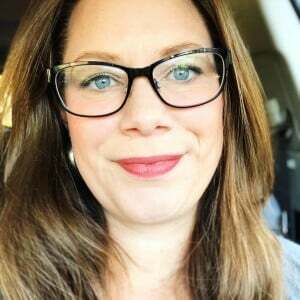 You are here: Home / food / Chimichurri – Best EVER Recipe! 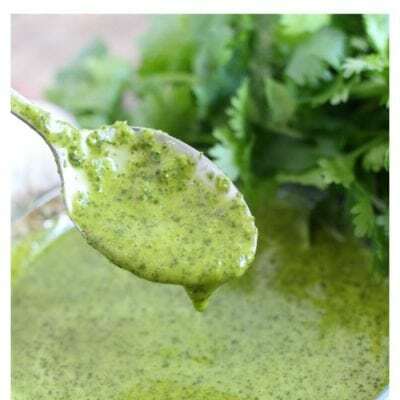 Chimichurri – Best EVER Recipe! 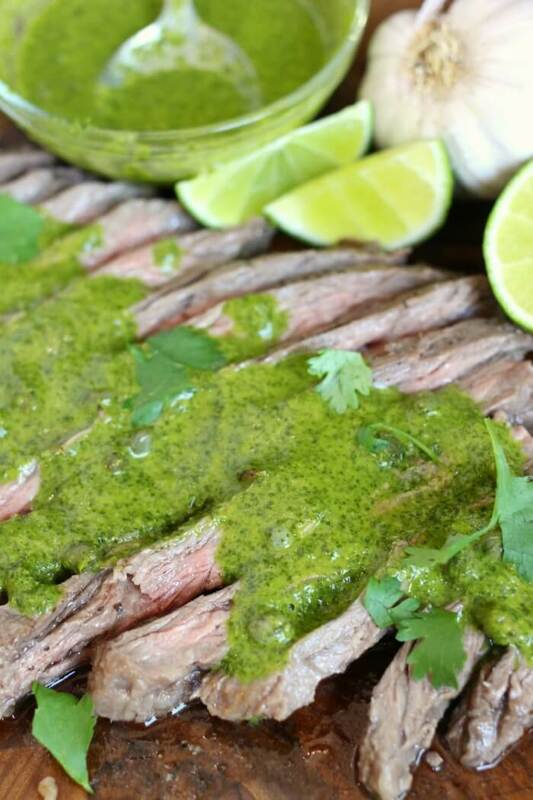 Chimichurri is perfect for marinating, dipping, and dressing pretty much everything! It’s easy to make and tastes amazing. You’ll wonder how you lived without it! Chimichurri is easy to make and delicious. There’s a new Mexican restaurant near my house that I am slightly obsessed with – their chimichurri is my new favorite and I’m excited to say I think I nailed it! Folks. Ohhhhhh, I think you’re going to love me for this one! Serve it over steak (here’s how to broil steak if you’re not able to grill), or fish tacos. I even like it on crispy chicken thighs! Goes great on a hot summer day with a bowl of gazpacho. cilantro leaves – I love cilantro and could eat it on nearly everything. 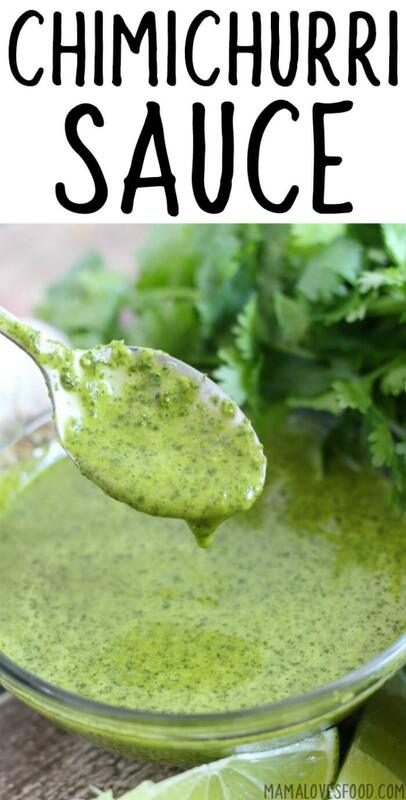 This recipe makes beautiful music of cilantro. 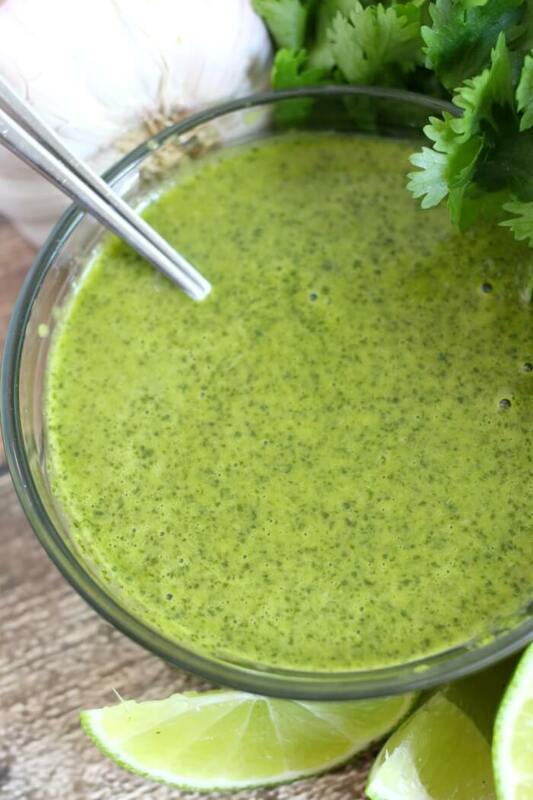 If you’re on team cilantro then you’ll definitely want to make this chimichurri sauce. 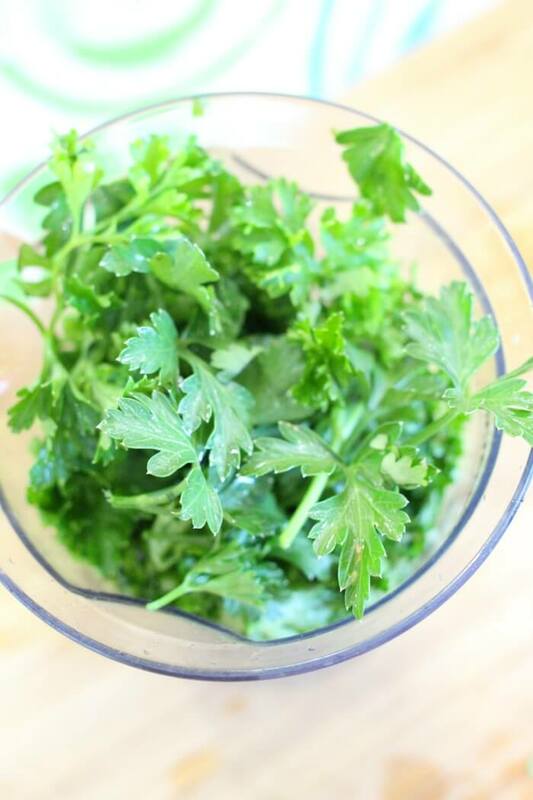 parsley leaves – The cilantro in this chimichurri recipe is tempered by parsley. I find that it stretches the flavor without making it overpowering. salt – Salt is so key, it intensifies flavors and should not be skipped. garlic – I like to use fresh garlic cloves, but if you’re in a pinch the stuff from the jar or squeeze bottle will work too. olive oil – Try to choose a good quality olive oil as it will be the carrier for all this amazing chimichurri flavor. 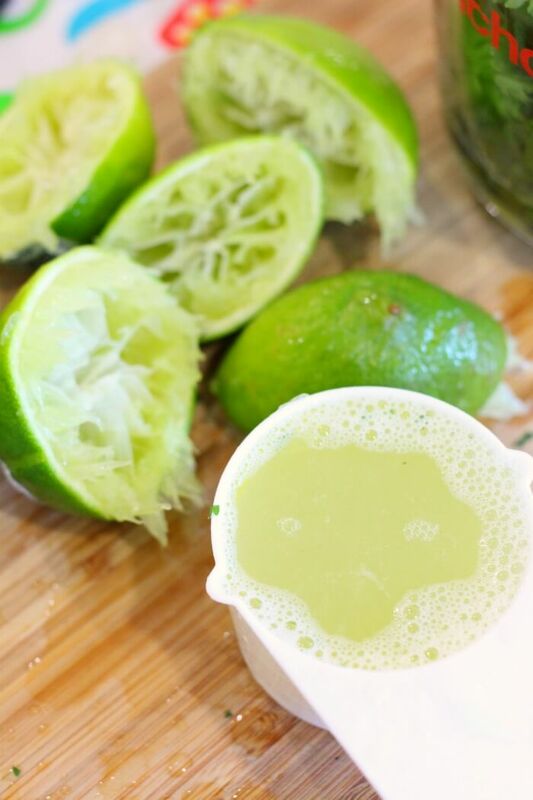 lime juice – Again, fresh limes are always going to be best, but I have been known to use the stuff in the bottle shaped like a lime before. It’s not ideal, but it’s better than not having chimichurri! capers – Not all chimichurri recipes use capers, but they’re one of my favorite parts of this recipe (sighhhhh, fine, skip them if you hate capers). They add a bright note on top of the sauce. Almost like a little caviar pop, since we leave them whole! This sauce uses all fresh, bright and delicious ingredients, but can be frozen so you’ll have these amazing flavors on hand any time you want. If you don’t want to freeze, no worries, the oil and lime will keep it preserved in the fridge for several weeks if not longer. Is Chimichurri good for you? Chimichurri is very good for you! It’s made with healthy oil (olive oil), greens that are packed with vitamins and nutrients (parsley and cilantro), as well as garlic which is touted as heart healthy and an antioxidant. Sometimes I like to make it a double healthy whammy by serving a protein with chimichurri and pico de gallo or bruschetta topping. YUM! What do you put chimichurri sauce on? We put chimichurri sauce on nearly every protein! I love a skirt steak chimichurri and roasted potatoes. But it’s also amazing on crispy chicken thighs, and fish tacos! I’ve even been known to put it over my steak salad on occasion. Mmmmm. I’m pretty sure this sauce could make even the gloomiest days look bright. We may be getting into those dark winter evenings that come too early, but make a great steak with your cast iron and throw this over top to forget all your seasonal worries. And throw in a margarita while you’re at it. How long does chimichurri last? Chimichurri can last couple of weeks in the refrigerator, or in the freezer indefinitely. What is chimichurri sauce like? Chimichurri is an earthy, tangy, uncooked sauce used as a marinade, dressing or topping on meats, salads, sandwiches, and other foods. Some folks like it rough chopped with a lot of texture and others (like me!) prefer it blended smooth. It is made primarily with cilantro, parsley, and lime juice so it is a bold bright citrusy flavor that is someone unique in its ability to go well with heavier gamey meats like steak and lamb, but also light dishes like fish and even salads. What is chimichurri supposed to taste like? 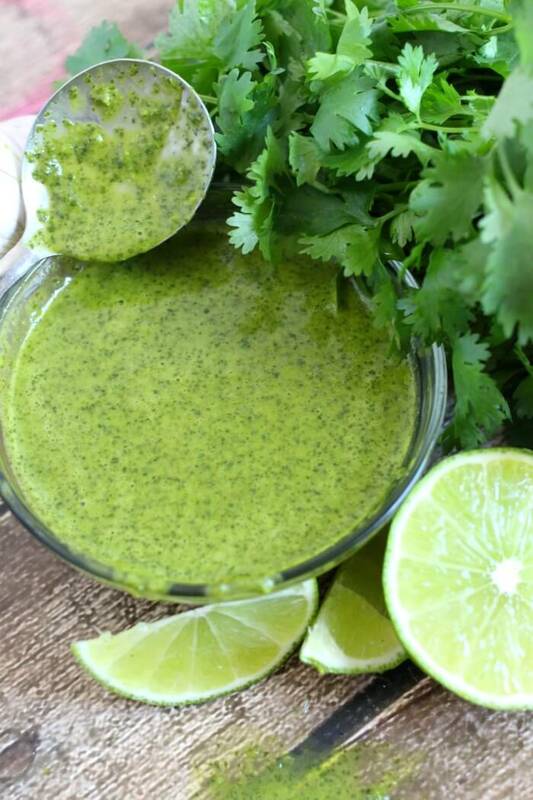 Chimichurri is intensely bright and acidic from the lime juice, with heavy herb flavors from the cilantro and parsley, with a great undertone of garlic. Our recipe for chimichurri is not spicy, but you can absolutely make it spicy by adding jalapeno or other peppers to the sauce. Either add it to the blender or finely dice it and stir in when you add the capers. 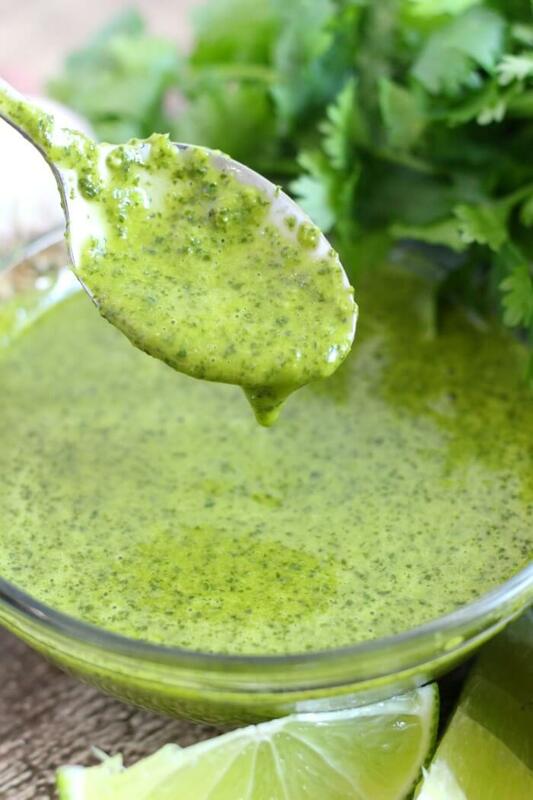 Chimichurri Is perfect for marinating, dipping, and dressing pretty much everything! You'll wonder how you lived without it! 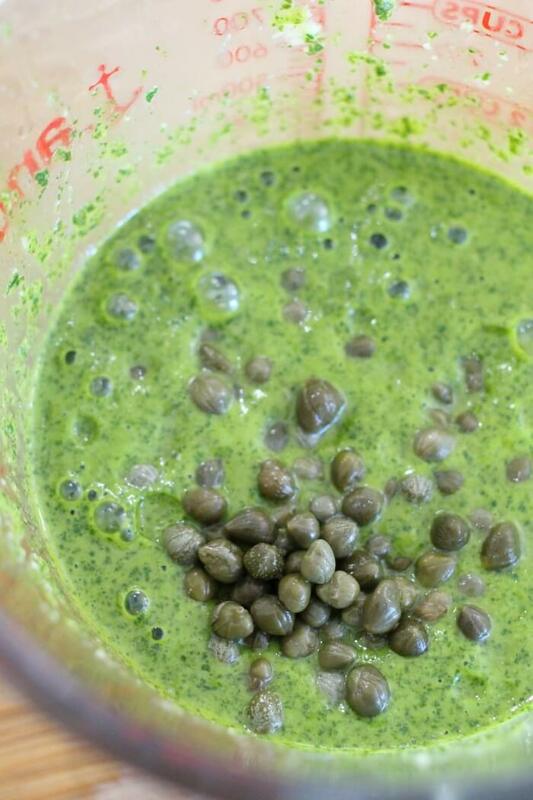 Add everything except capers to your blender (or you could use a stick blender), and pulse until smooth. Stir in capers (so they stay whole), and store in the refrigerator. This can be used right away but it best after 24 hours so the flavors can marry. 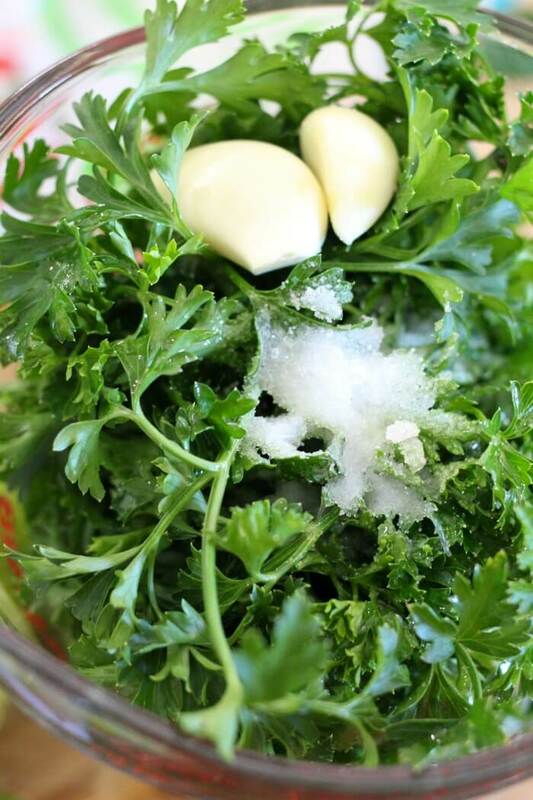 Do you use flat leaf parsley or Italian parsley? 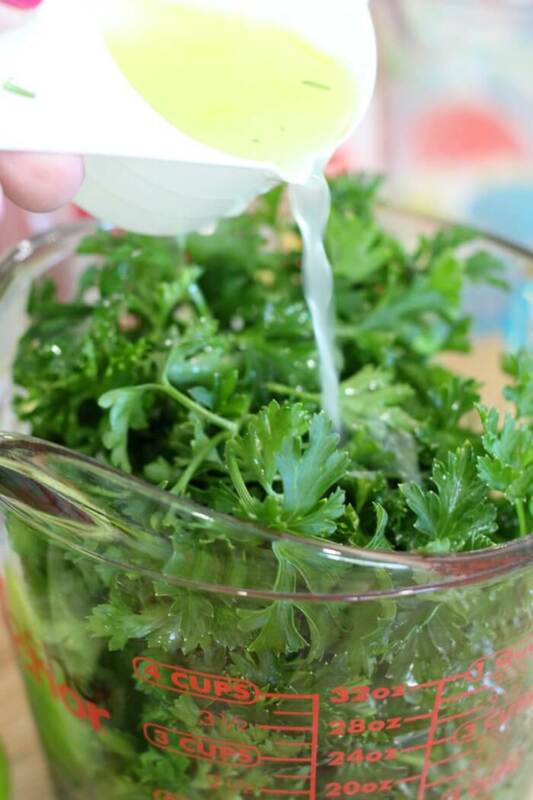 Flat-leaf parsley is Italian parsley. This stuff is good enough to drink 😉 So happy to have this awesome recipe on hand! Looks like a great sauce!! We love our sauces, they add such a nice dimension to a dish. We always have some kind of sauce on hand — just in case we need that extra zip and this sauce fits the bill.